Calling all pumpkin lovers! 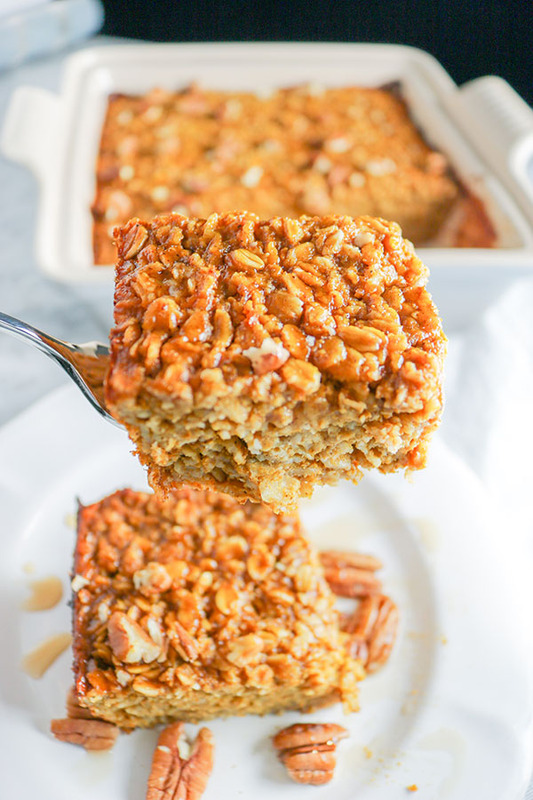 This Pumpkin Pecan Baked Oatmeal is PERFECT for you! So if you have been following my recipes in the past, you probably have come to realize that I am a LAZY weekday breakfast eater. I love breakfast food. It is probably my favorite type of food! But, weekday mornings are tough! Between walking the dogs, getting myself ready, and of course snoozing my alarm 6 times – there is just not enough time in the morning to get everything done! 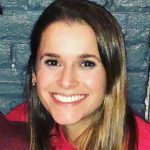 (I know… wait until I have kids – then I will really be in trouble!) I love easy, grab n’ go breakfast foods – hardboiled eggs, fruit, overnight oats, and of course – baked oatmeal. 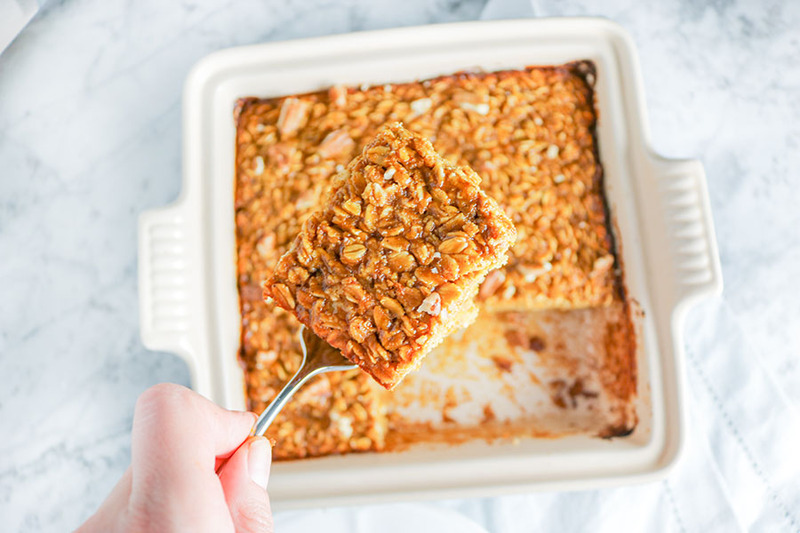 A few months back I made a delish, totally vegan Peanut Butter Banana Baked Oatmeal. THIS Pumpkin Pecan Baked Oatmeal though.. its like fall in a pan! The recipe is not completely vegan because there are eggs used, but you can absolutely sub out the egg for an egg substitute like chia seeds! 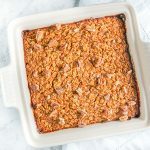 The recipe is super easy to make – you pretty much just have to mix all the ingredients together, put them in a square pan, and bake! 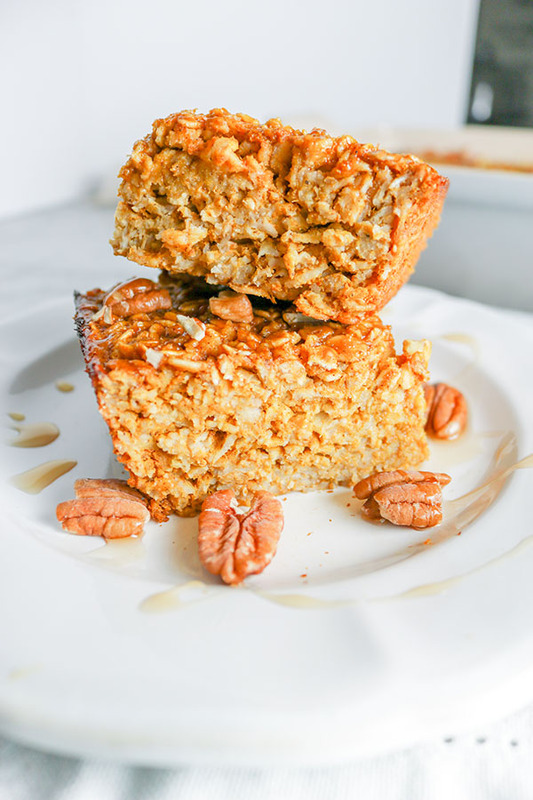 The result, delicious baked oatmeal to last you all week long! 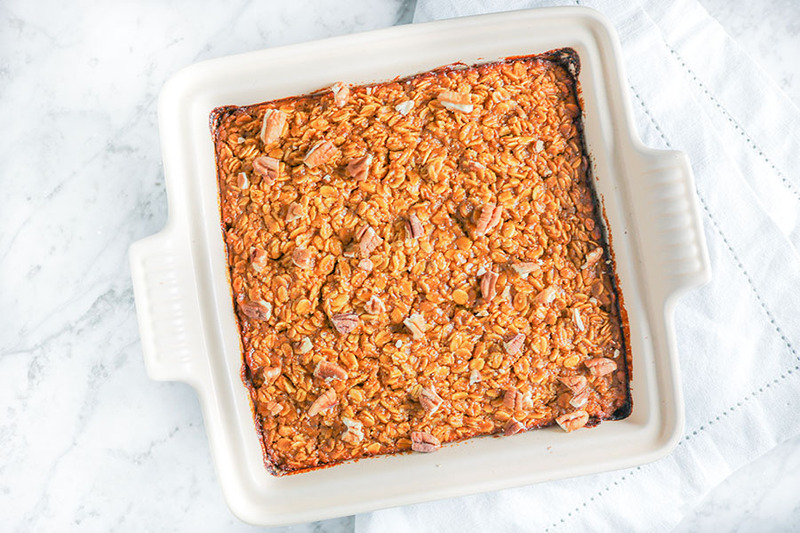 The pumpkin flavor is subtle, but the seasonings pack a punch – cinnamon, nutmeg, ginger, and cloves make this Pumpkin Pecan Baked Oatmeal anything but boring for your taste buds. Top with a little maple syrup, honey, or – my favorite – NUT BUTTER! Because nut butter tastes good on everything… and because it provides added protein to keep you fuller longer. I have developed a particular obsession with Wild Friends Peanut Cashew Super Butter – it is… SO GOOD! Its not cheap. I paid around $8 for my jar at Kroger – but I promise you will love it. It has honey, chia and flax mixed in. So it is a little sweet, but not too sweet – and flavorful! Subtle pumpkin flavor w/ cinnamon, nutmeg, ginger, & cloves. 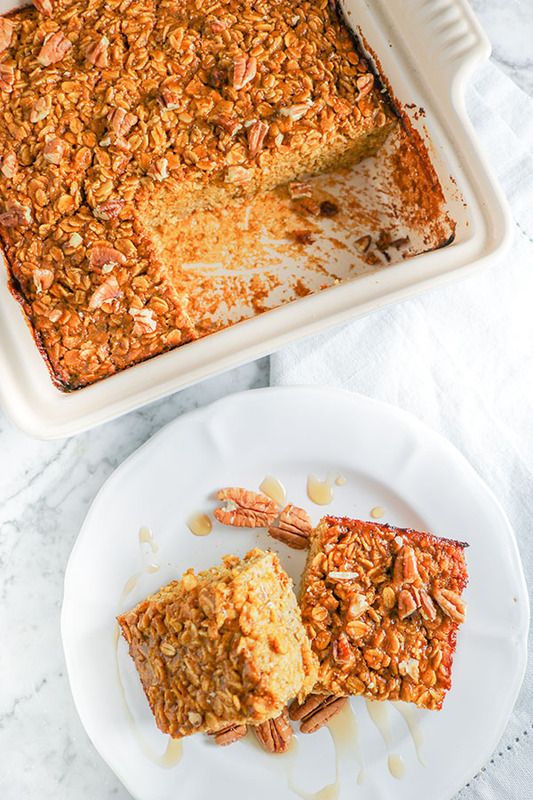 This Pumpkin Pecan Baked Oatmeal is like fall in a pan. Easy to make, convenient to grab n' go! Preheat oven to 350F. Lightly grease an 8 x 8 pyrex pan, set aside. Combine all wet oatmeal ingredients - whisk until smooth. Combine all dry oatmeal ingredients and blend. Pour wet ingredients into dry ingredients and blend until fully combined. Pour mixture into greased dish. in a small bowl, combine melted ghee, pecans, and cinnamon - spread over baked oatmeal. Bake at 350F for 45 minutes, or until an inserted wooden toothpick comes out clean. Storage: Refrigerate in an airtight container for 2-3 days. Freeze for up to 1 week.